Once again Jameis Winston proves to be efficient in the stat department, despite fumbles and bunch of interceptions. He is 6th in the NFL with 929 passing yards, tied for first in touchdowns thrown. It’s safe to say that the start to Jameis Winston’s sophomore year has been a fierce one, as he has been nominated two times for the NFL’s Air Player of the Week and won it in the first week. To tack on some more “pats to his back” he was also awarded the NFC’s Offensive Player of the week for his game against the Atlanta Falcons. If he continues this kind of performance throughout the rest of the season, it’s safe to say, that the Buccaneers will have a new all-time single-season passing leader, by December of 2016. 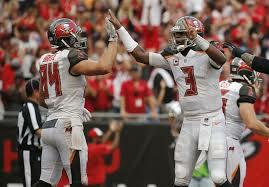 Bye Week is Almost Over What Has Tampa Done To Correct Secondary Woes? Winston: Stats and talent level wise, I’m one of the best.